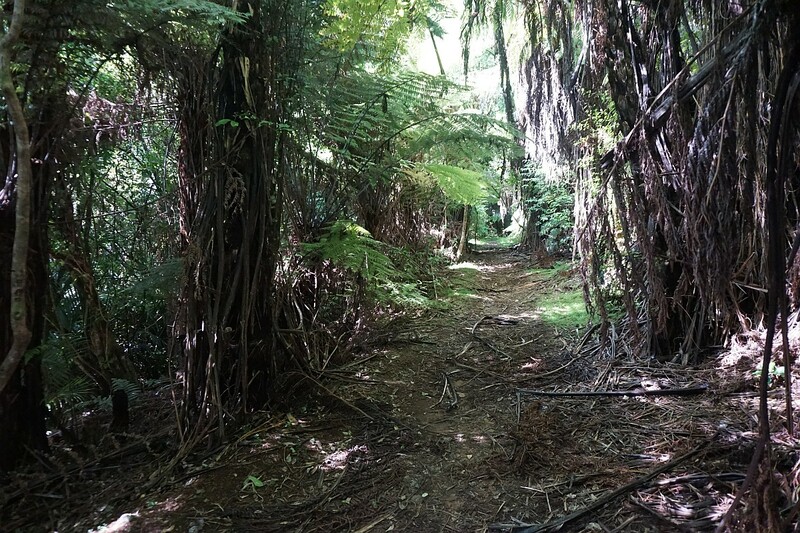 The Mangakino Pack Track Loop can be walked in either a clockwise or an anti-clockwise direction. 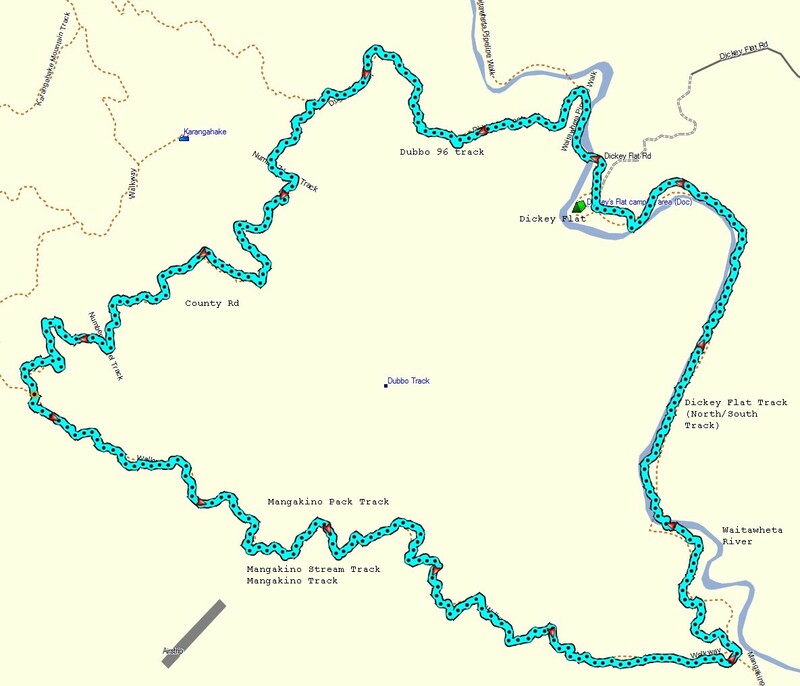 This time it was done anti-clockwise, starting and ending at Dickey Flat. Starting at the campsite the walk starts with a bridge crossing over the Waitawheta River and then heading north for about half a kilometer before branching off on the Dubbo 96 Track. Dubbo 96 Track is a 2 km long narrow track with steeper sections and a single stream crossing. It ends at County Rd Track, also known as Number 7 Level Track. 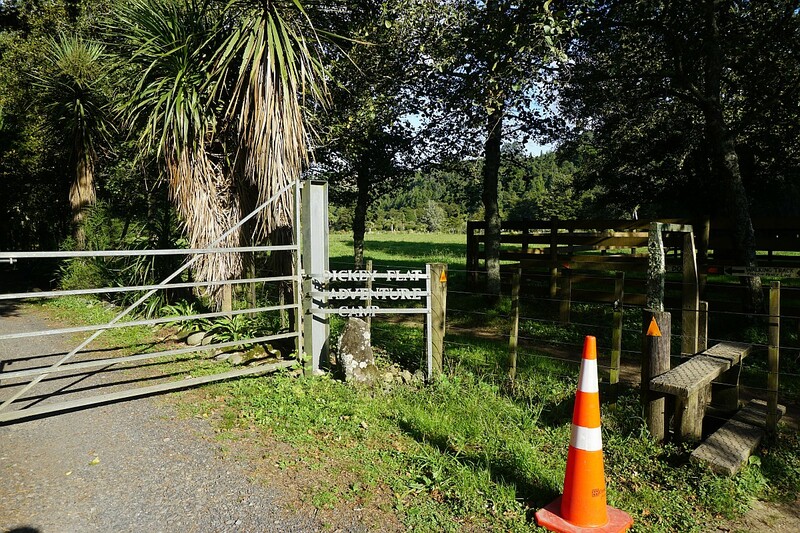 County Rd heads south-west for about 3.5 km in a gentle incline before meeting with Mangakino Pack Track and a track to the summit of Mt Karangahake. It is mostly a wide, easy track which was once a road. Mangakino Pack Track from County Rd to the Waitawheta River is a very rough track in places, about 5.4 km long, and not very well maintained. 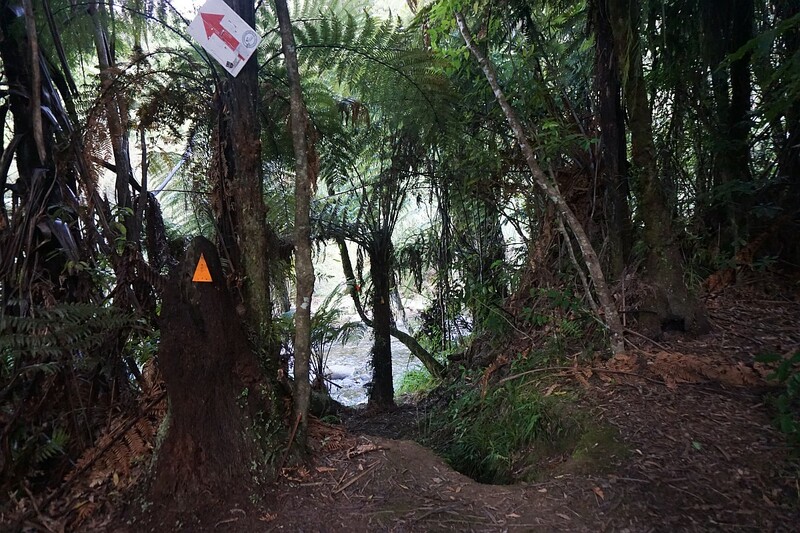 Orange triangles marking the track are often partially hidden or missing, the track across the many small gullies has mostly been washed out, and fallen trees force short track detours. 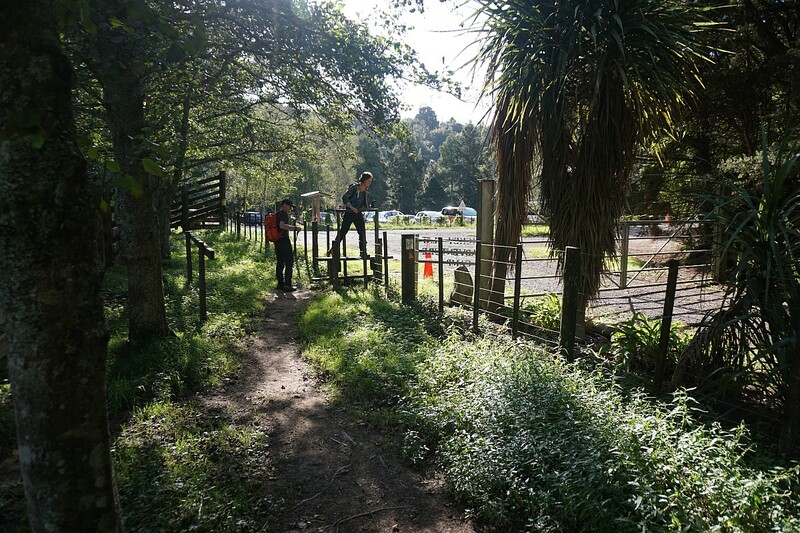 By the Waitawheta River the Mangakino Pack Track joins up with the Dickey Flat Track, also known as the North/South Track, which leads back to Dickey Flat campsite, and continues onward across the river towards Dean Track and Dalys Clearing. 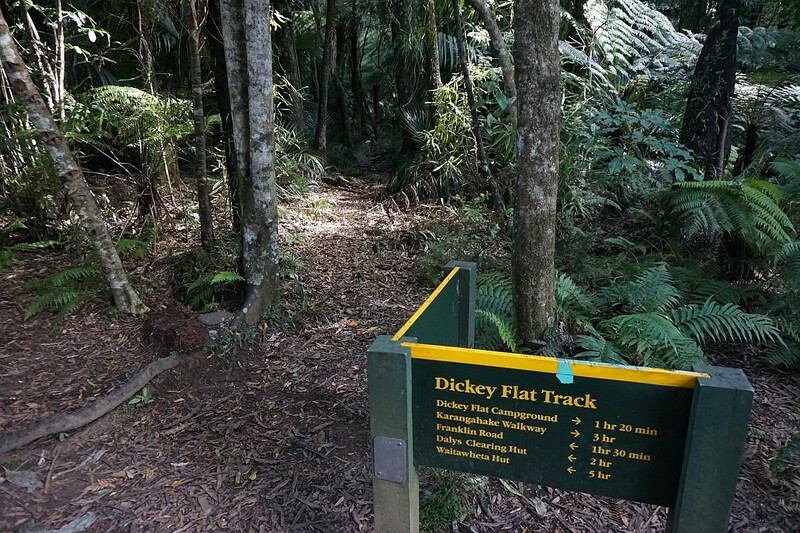 On Dickey Flat Track there is a single crossing of the Waitawheta River just over 1 km from the junction with Mangakino Pack Track. Total walking time for the loop is signposted as 6 hours, but on this occasion it took about 6 hours 50 minutes, including about 20 minutes for a lunch break. 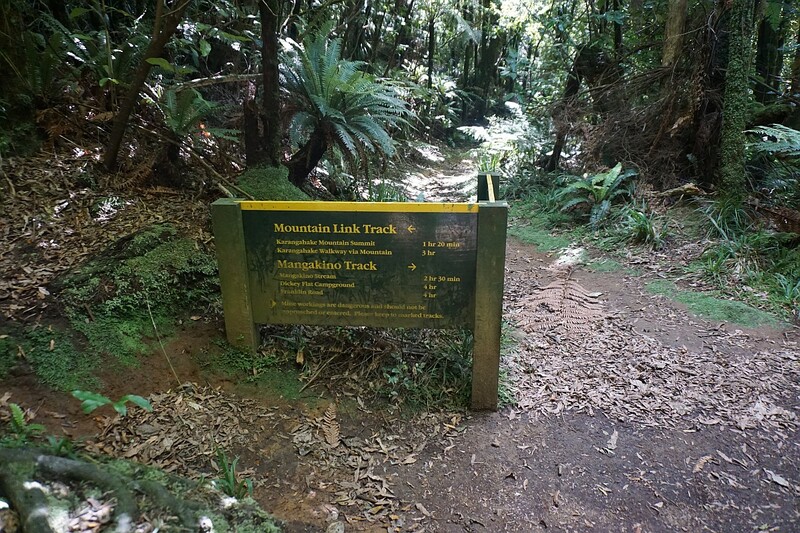 Total distance is about 15.2 km, with a lowest elevation of about 100 m above sea level, and a highest elevation on County Rd of about 445 m.
Some information about the tracks is found in the Kaimai to Coast DoC brochure (pdf downloadable). 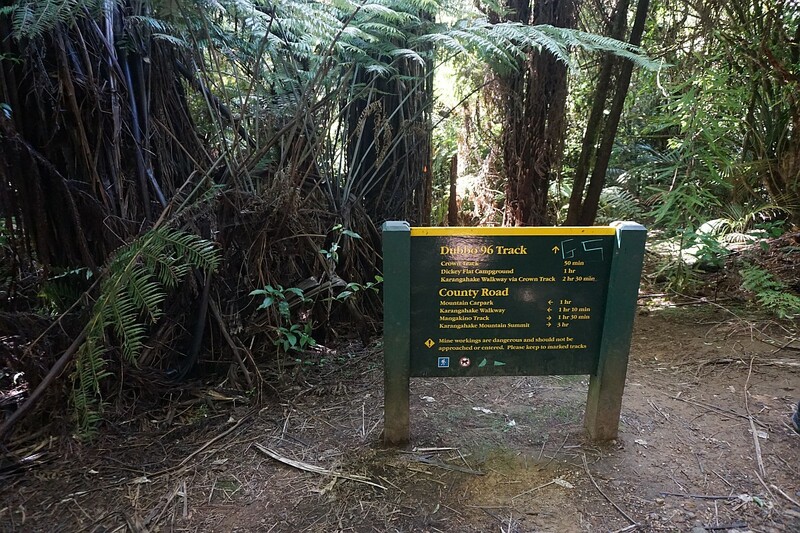 Information about the Dubbo 96 Track can be found in the Dickey Flat to Karangahake Loop post on this site, and the County Rd track is described in the County Rd to Mt Karangahake Summit post. 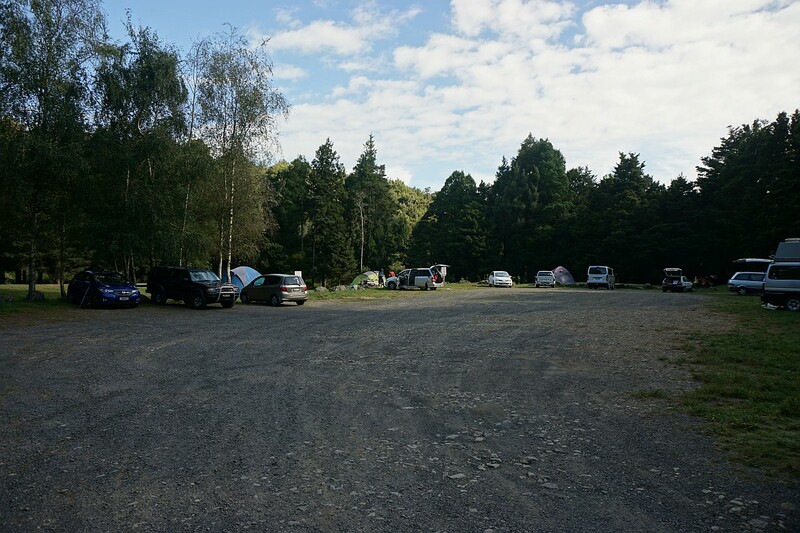 The parking area at Dickey Flat campsite. 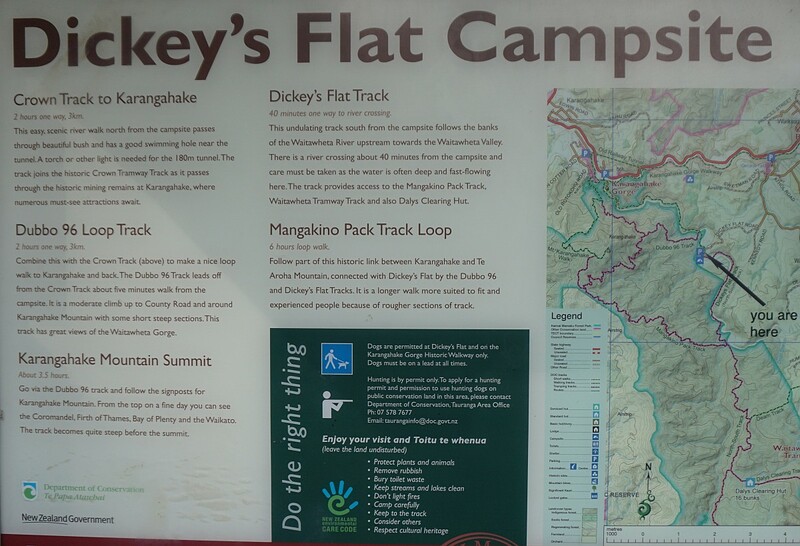 An information panel at the campsite with a description of the Mangakino Pack Track Loop and some of the tracks making up the loop. 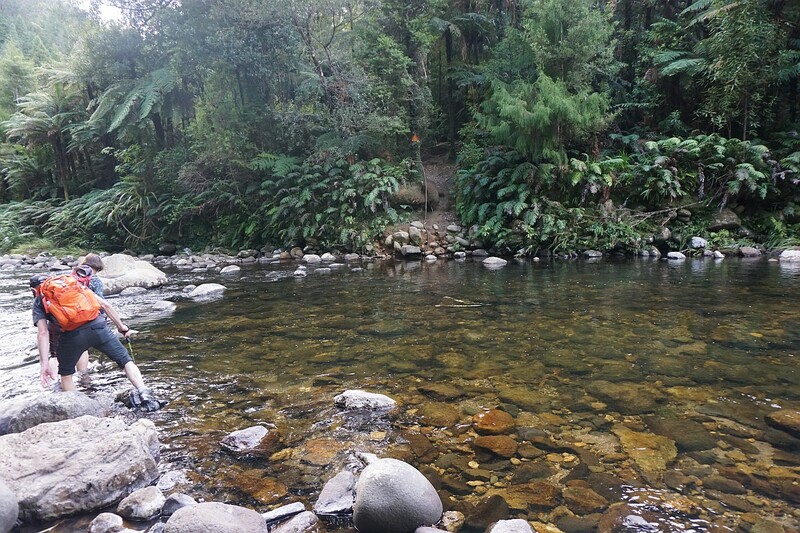 About 650 m from the campsite, after crossing the Waitawheta River on the bridge marking the northern end of the campsite, the Dubbo 96 Track branches off to the left. 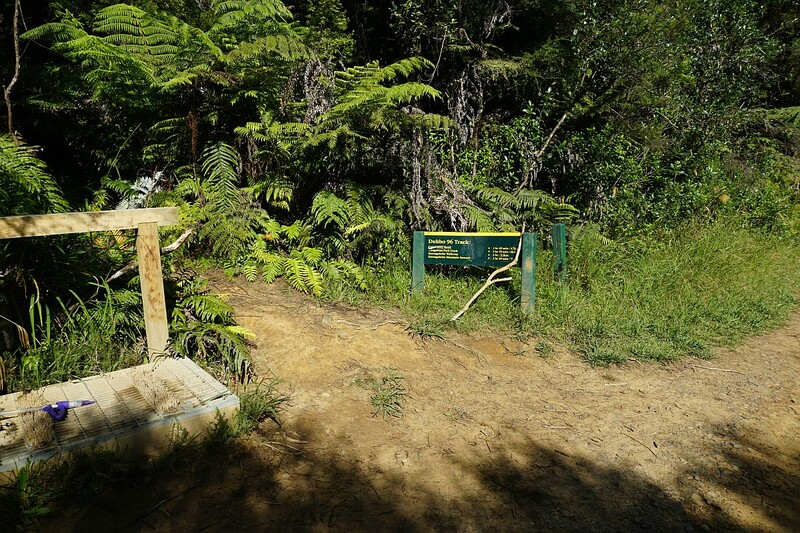 There are facilities for cleaning boots to protect kauri trees from the spread of kauri dieback disease. Dubbo 96 Track ends at a junction with County Rd. This is looking back down Dubbo 96 Track from County Rd. The time to Mangakino Track is shown as 1 hour 30 minutes, but took almost exactly one hour. Looking along County Rd from the junction with Dubbo 96 Track. 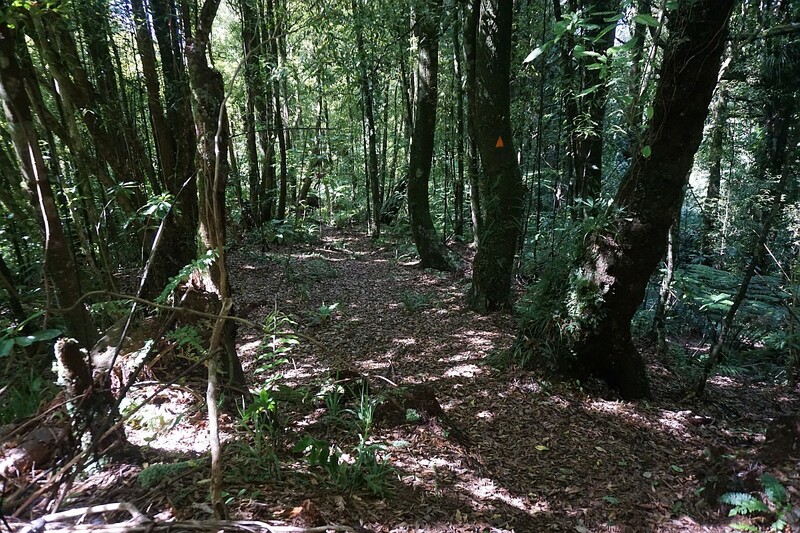 The County Rd junction with Mangakino Pack Track (here called Mangakino Track) and the Mountain Link Track to the summit of Mt Karangahake. This is looking back down County Rd. 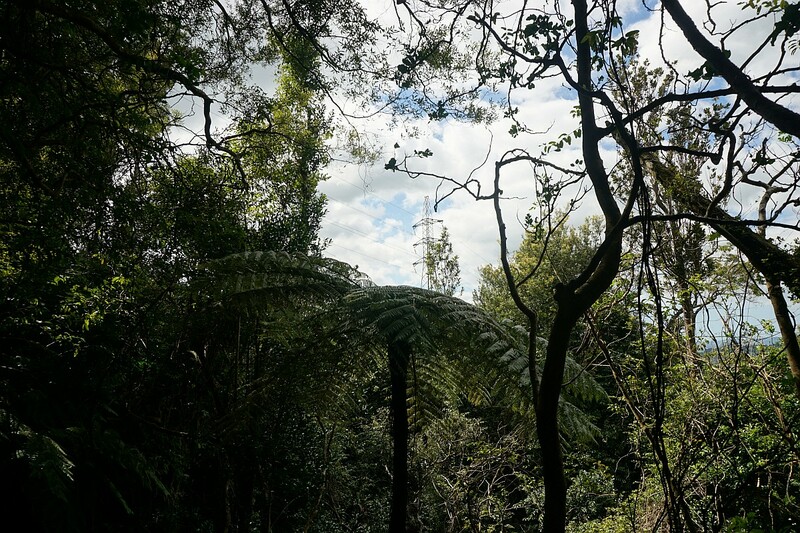 Looking down Mangakino Track from the junction. It starts out as a fairly steep and rough track before joining up with the actual original pack track. 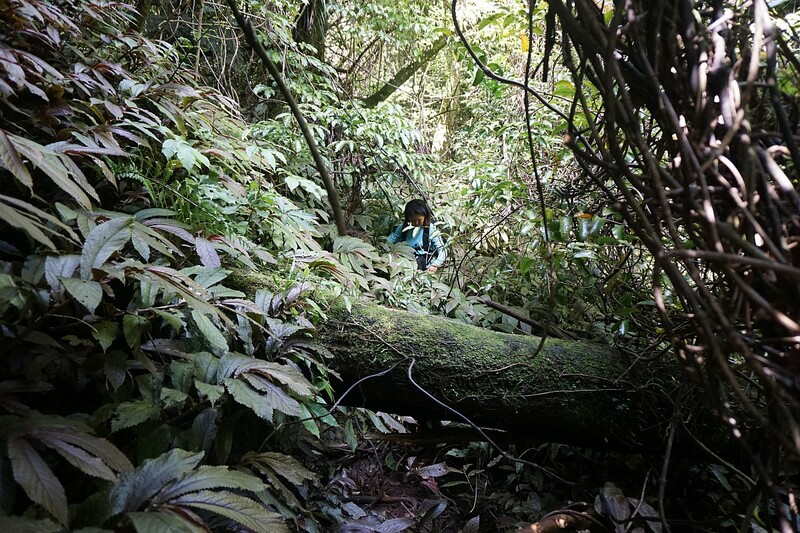 The track is not always obvious or easy to find. The original pack track parts are have an easy contour and were cut into the side of the hill. Unfortunately large parts of it have washed away. 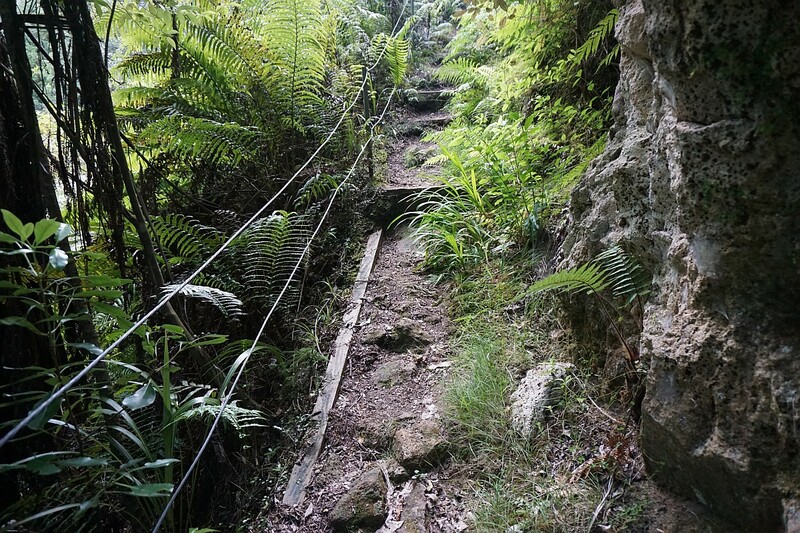 Here part of the original pack track can be seen. 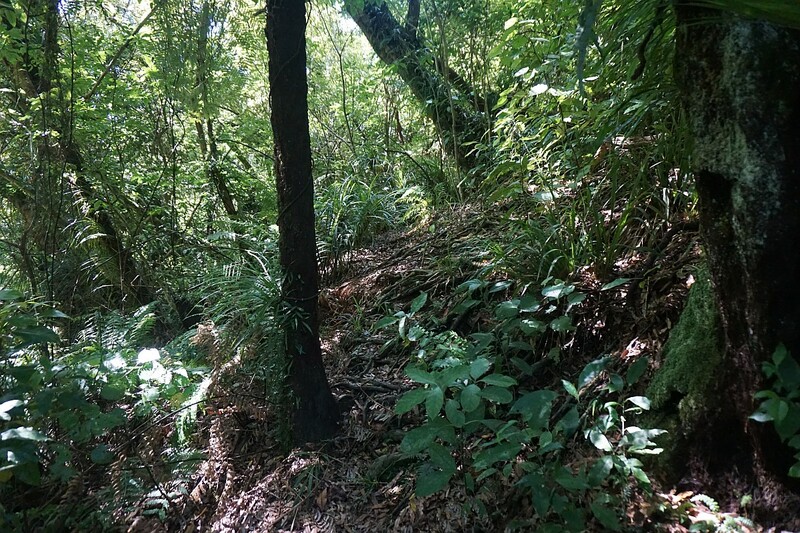 Vegetation covers parts of the track where the original track has washed away, mostly in the many small gullies that the track crosses over. Fallen trees also slow down progress along the track. The deeper washouts can be difficult to cross, with no easy or obvious detours around them. 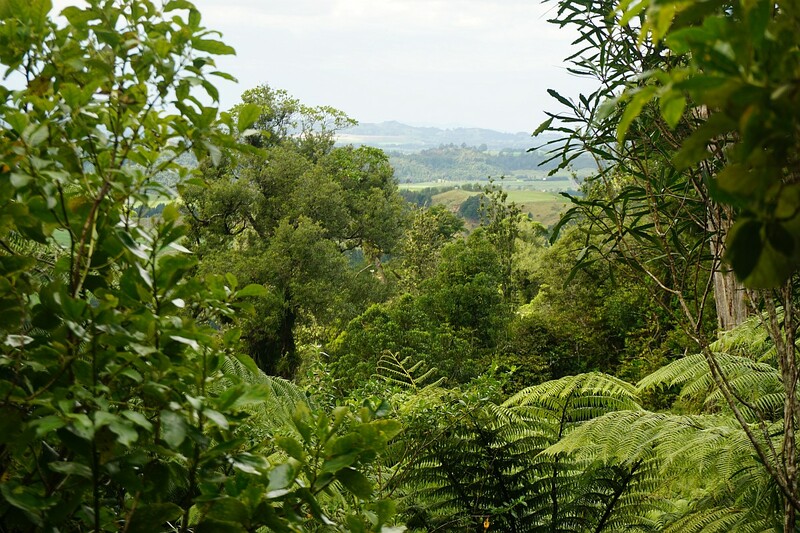 There are only very occasional openings in the regenerating forest allowing for views further afield. A major power transmission line from the Waikato to the substation on Pukekauri Rd crosses over the track. An infrequently used line maintenance road also crosses over the track near the power lines. 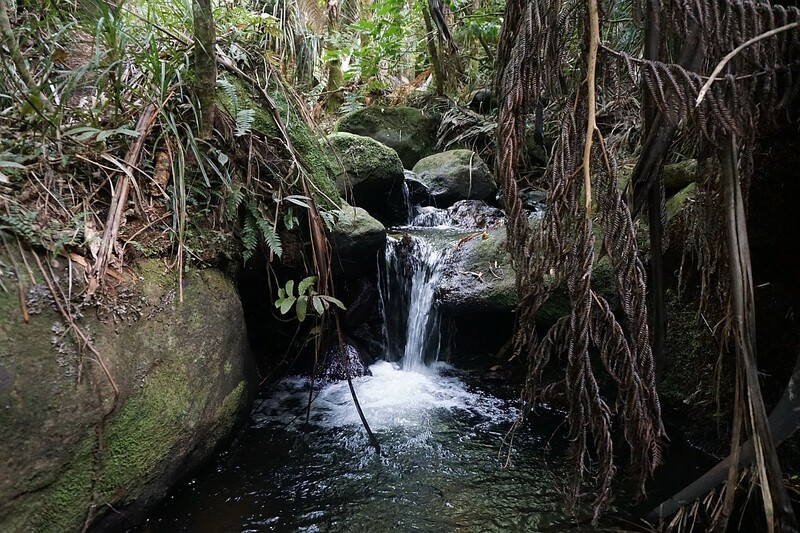 Several small streams run down the gullies crossed by the track. This walk was done in late summer, with no recent heavy rain to swell the streams. 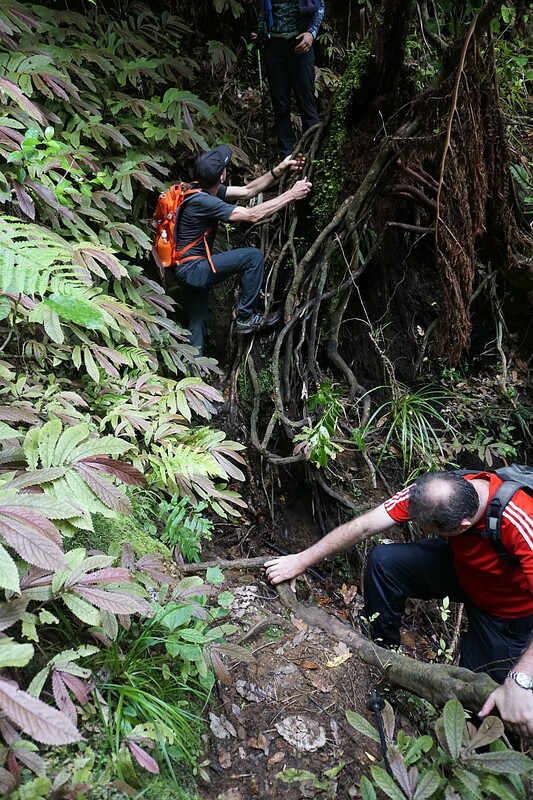 Another steep bypass of fallen trees and vegetation. Approaching the junction with the Dickey Flat Track (North/South Track) alongside the Waitawheta River. The DoC signs at the junction, looking towards Dickey Flat. 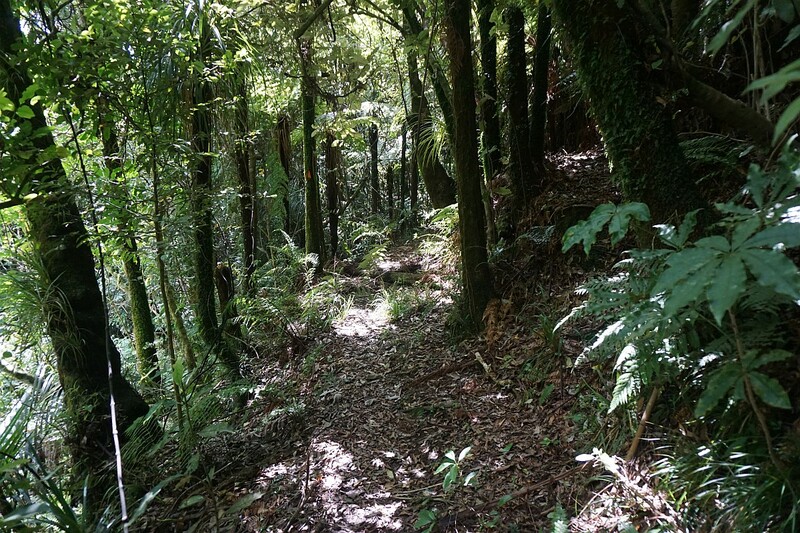 And looking back up the Mangakino Pack Track. The North/South Track continues southwards with a river crossing towards Franklin Rd and Dalys Clearing. From the junction the Dickey Flat track climbs and falls while following alongside the Waitawheta River. 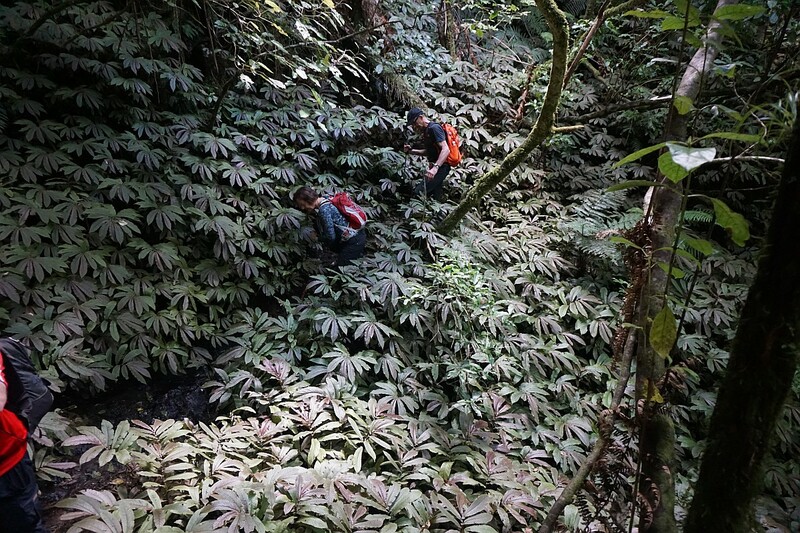 The river is seldom visible from the track. 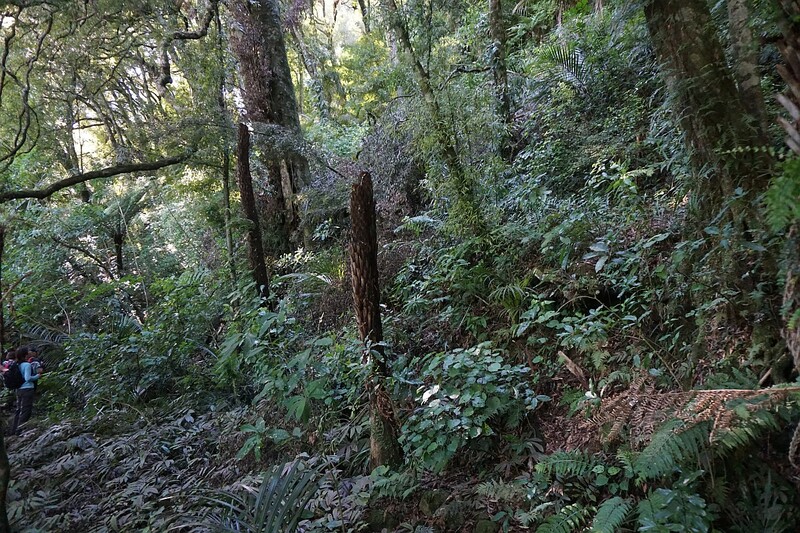 There are stands of regenerating kauri and other trees along the track. 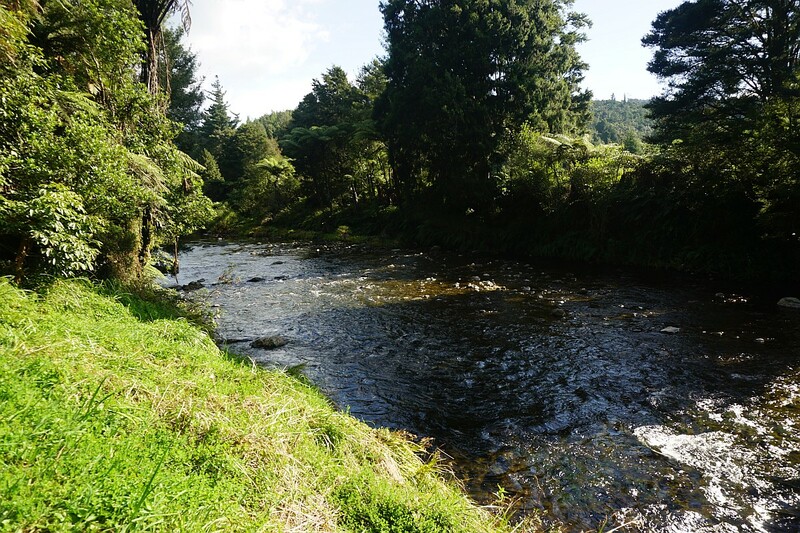 The Waitawheta River crossing location. 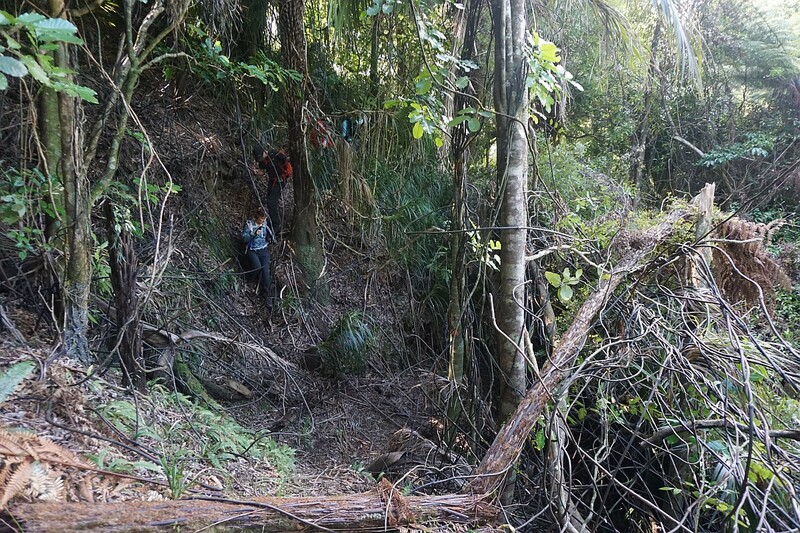 The track continues on the opposite side, with a rope conveniently placed to assist on the steep and slippery bank. The river is fast flowing, and more than knee deep even after a period with no rain. 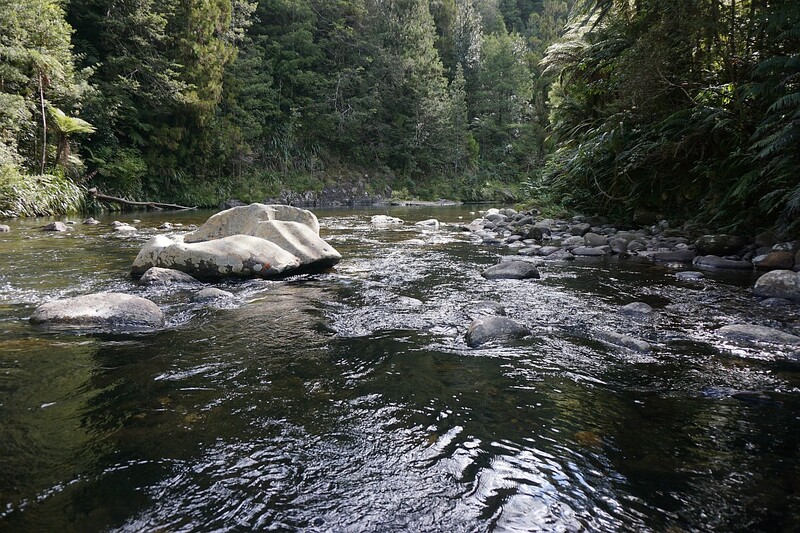 The rocks in the river are very slippery so care is required when crossing. Looking downstream from the crossing. Looking back after crossing the river. 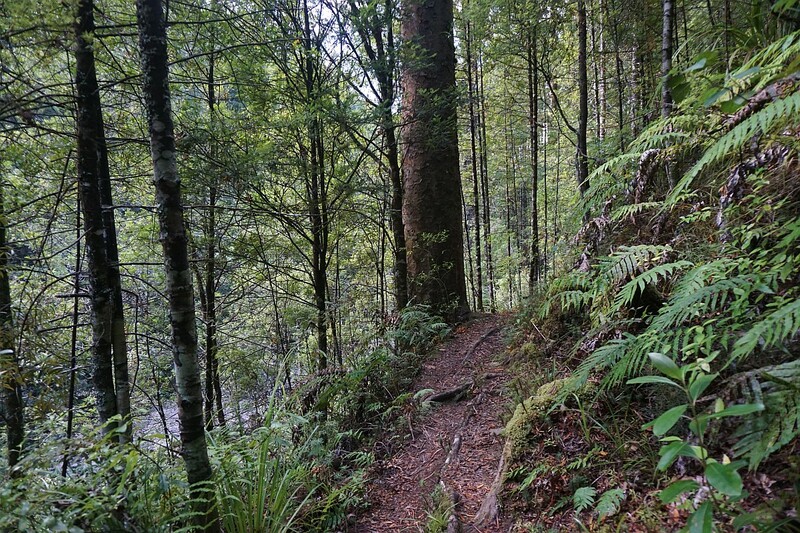 The undulating track back to Dickey Flat follows the river on the eastern side, with some steep dropoffs down to the river. 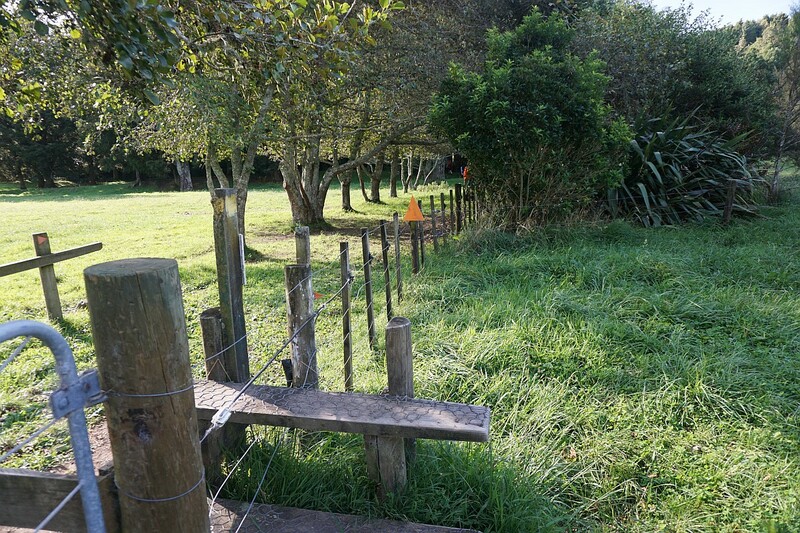 Wooden barriers with gaps for walkers have for some reason been placed in various locations along the track. 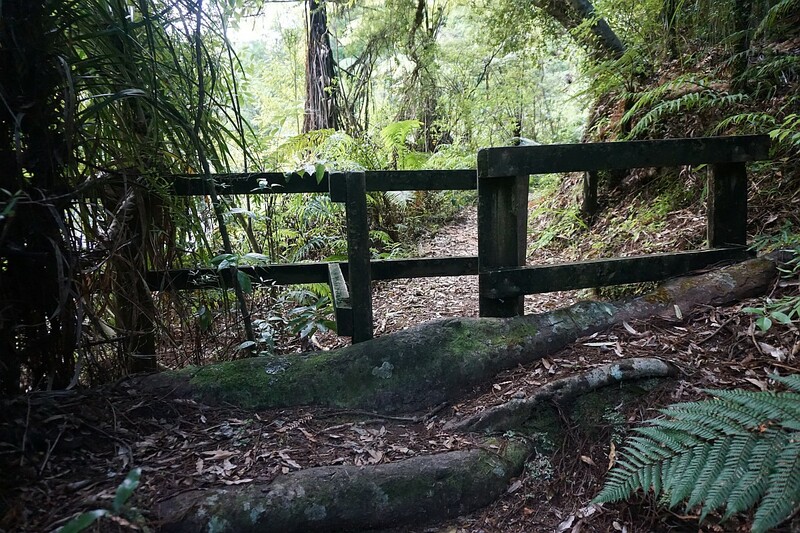 In a single location there is also a simple wire fence along a section of track with a steep dropoff down to the river. 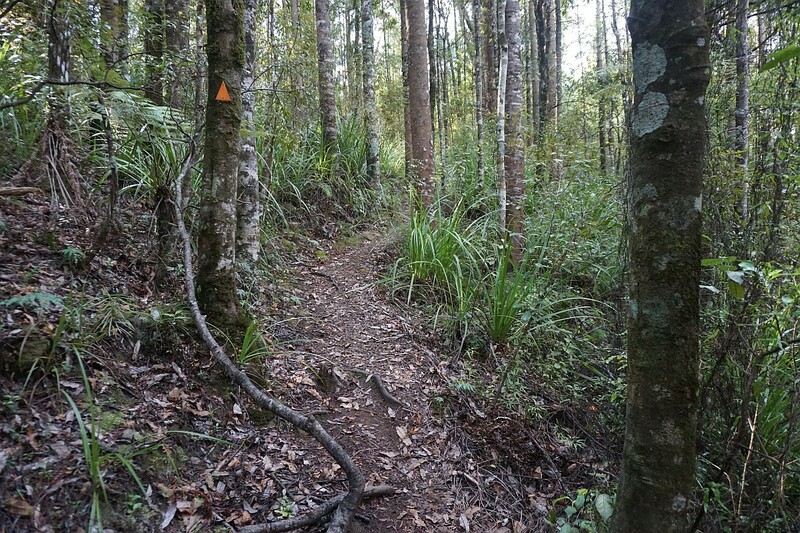 A number of small and larger kauri trees can be found alongside the track. The river is clearly visible for most of the way along this track. Here looking back up the river, with farmland on the opposite side of the river. Another small detour due to a tree fallen across the track above picture centre. The forested part of the track ends by the Dickey Flat Adventure Camp, and continues across grassland back to the campsite. 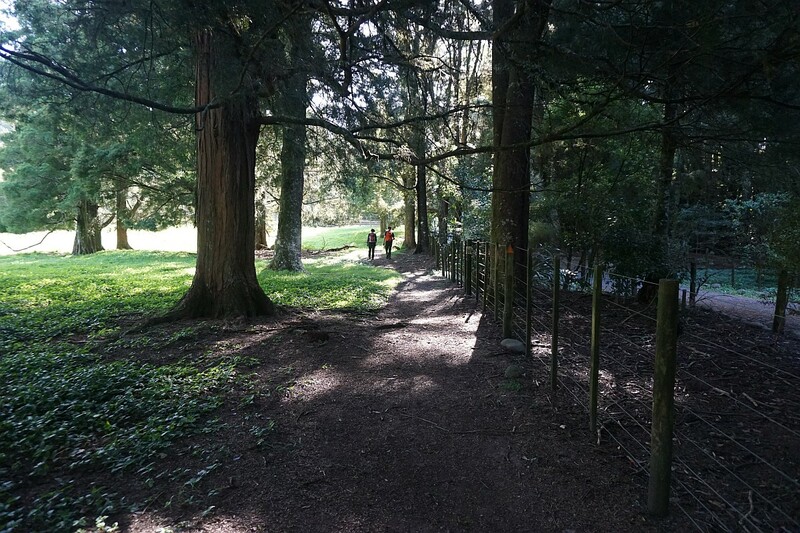 The track follows the fenceline and the row of trees. The track approaching the campground. 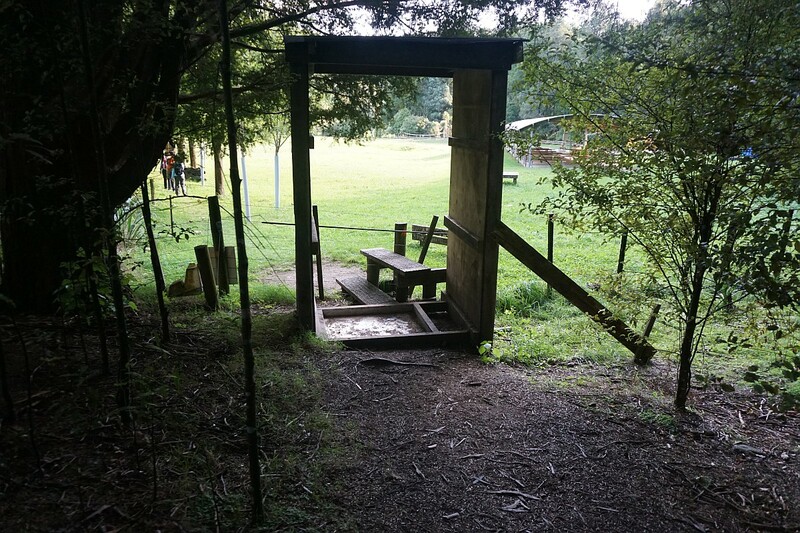 The last stile to climb over before entering the carpark at the campground. 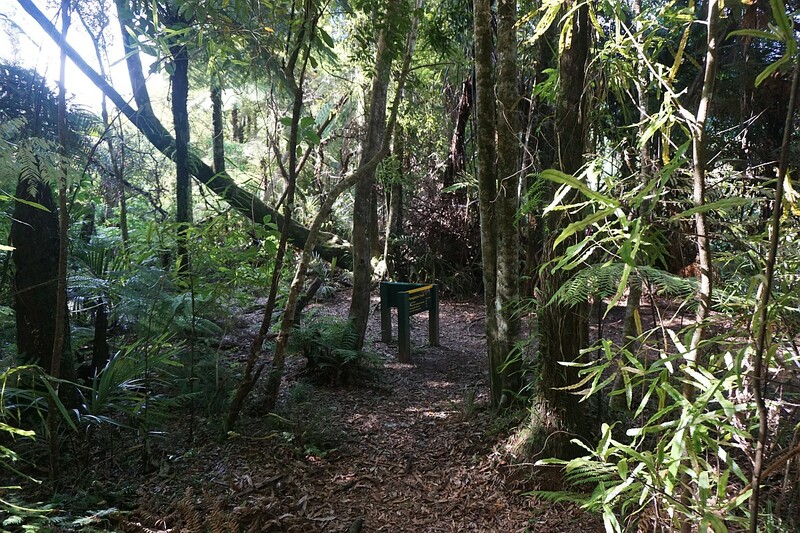 The ending (or starting) point of the Mangakino Pack Track loop. Dickey Flat to Dubbo 96 Track: 650 m, 10 minutes. Dubbo 96 Track: 2 km, 50 minutes. County Rd: 3.5 km, 1 hour. 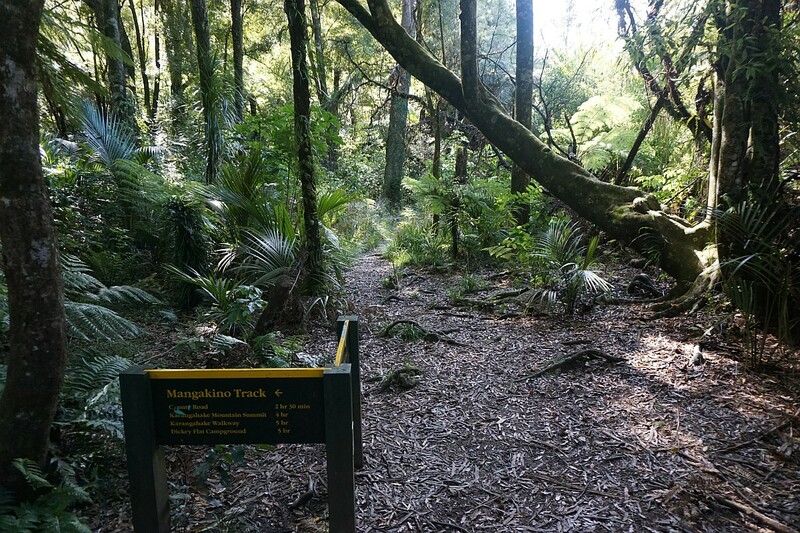 Mangakino Pack Track: 5.4 km, 2 hours 45 minutes. 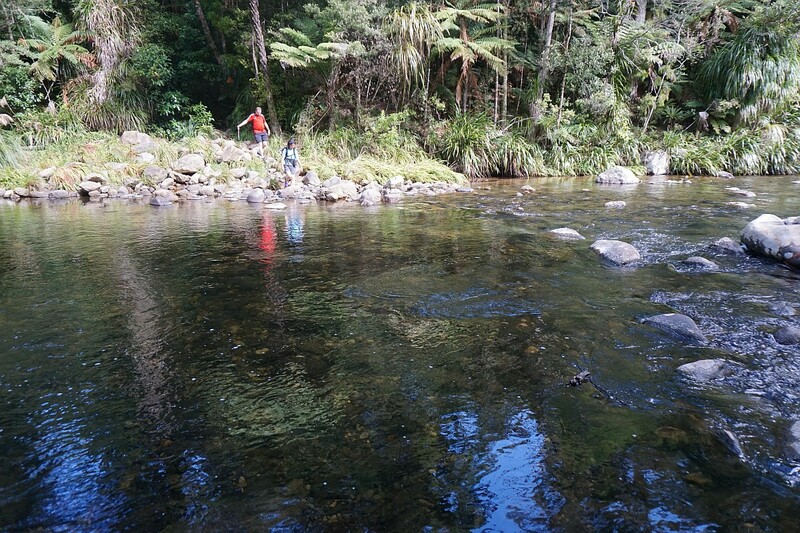 River crossing to Dickey Flat: 2.5 km, 55 minutes. Total distance 15.2 km, total time 6 hours 50 minutes, including about 20 minutes for lunch and several short breaks along the way. Lowest elevation at the campsite about 100 metres above sea level, highest elevation on County Rd about 445 metres. 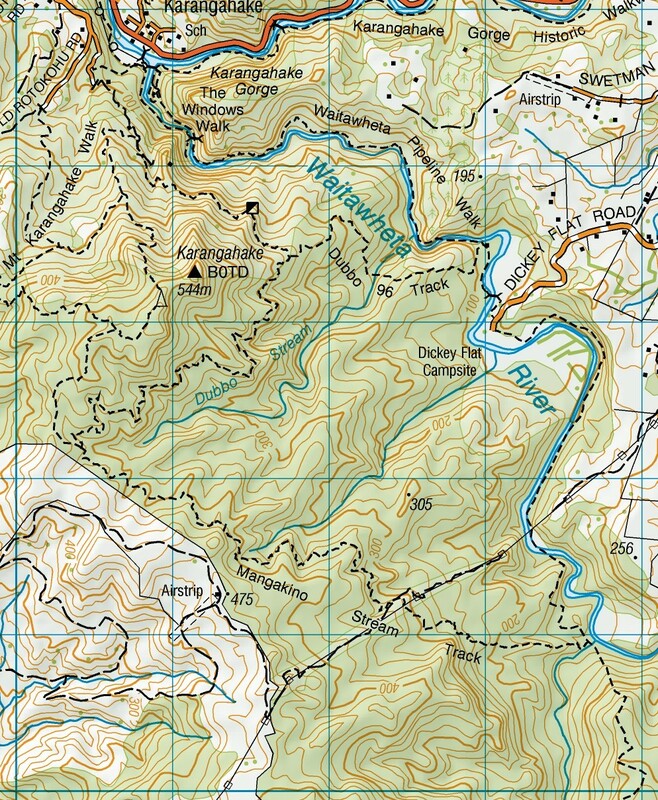 The topographic map shows the location of the tracks. The track was walked on March 13, 2016.